Now shortlisted for the UK Packaging Awards 2018 in the “Resource efficient pack of the year”, “Innovation of the year”, and “Consumer convenience award” categories. Garçon Wines has launched their wine bottle design, manufactured by award-winning RPC M&H Plastics in the UK. Inventor of the environmentally-friendly, innovative 750ml slimline wine bottle that is revolutionising wine retailing, logistics and delivery, Garçon Wines launches a partnership of their letterbox wine via the UK’s fastest growing online florist Bloom & Wild and the startup which has mastered letterbox flower deliveries. Passionate about manufacturing the product in the UK while remaining focused on tackling pollution from plastic waste, Garçon Wines worked with RPC M&H Plastics to develop bottles made from 100% recycled PET and that are fully recyclable, meaning no new virgin plastic is created and they conform to the traditional Bordeaux wine bottle shape. Bottles made from the right plastic and used responsibly are presently the greenest wine bottles available and Garçon Wines offer the most sustainable solution. The recycled material is significantly lighter than glass and tough enough to withstand the postal system. The unique design means the packaging can fit securely and conveniently through a standard sized letterbox meaning no missed deliveries and ultimately leading to further reductions in CO₂ emissions. 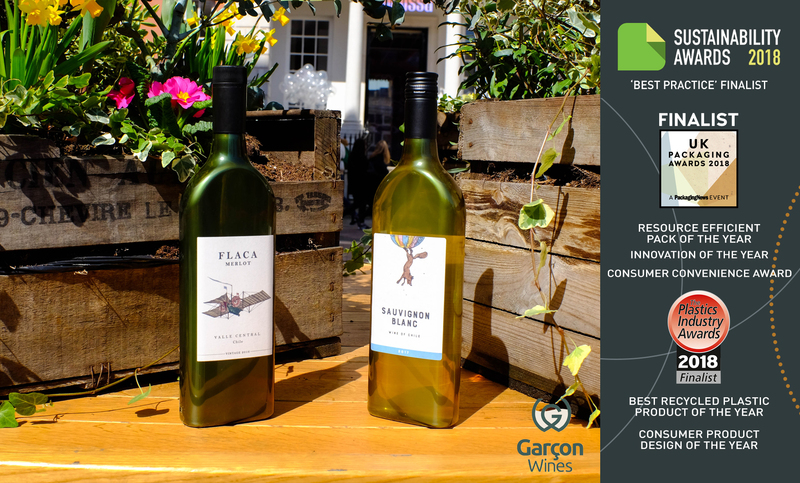 Garçon Wines offers the ultimate in delivery convenience; wine perfect for the ‘Amazon generation’. Garçon Wines is now available from Bloom & Wild.